Face painting Gallery for photos. Glitter tattoos are a fantastic and fun way to entertain your guests. Glitter tattoos will add a sparkle to any occasion! 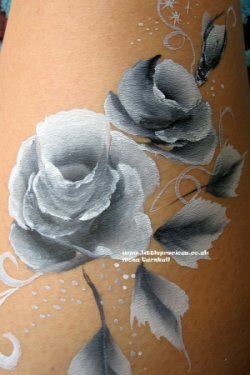 There are many different stencils available to choose from with varying designs and they can be applied with a spectrum of colours. They can last for up to five days. I use all natural ingredients together with henna powder creating a wonderful paste. Henna is a natural ancient dye made from dried henna leaves. Henna designs on skin can last up to 2 weeks. Bump art or Gestational art is a wonderful way to celebrate your pregnancy by capturing a precious memory with a beautiful design on your baby bump. Any custom design can be catered for including reproducing ultrasound scans. Each child will get nail art, a glitter tattoo and funky hair. A maximum of 12 children for a 2.5 hour party. Read more about Mini Makeover Party. Offering custom hand painted gorgeous items including walls! All artwork and murals are painted freehand which are unique and personalised to your taste and requirements. Murals are painted with non-toxic acrylics. The artwork is then embellished with glitters, metallic paints and gems. Please contact me with your idea or I can create designs for specific rooms with a theme to suit your personality. Please contact me for a no obligation quote, and I can paint any size of room, any space both indoors and outdoors.